One of the downsides of a career as a scientist is you spend a lot of the early part of your career in temporary positions. For the past 12 years I’ve never known if I still be living/working where I was 6 months in the future. I’ve finally reached a point in my career where that is no longer the case, meaning I can finally re-start brewing beers that require multi-year commitments – i.e. barleywines and sour beers. It has been over 8 years since my last batch of either of these two lascivious beer styles, despite them being among my favourites. It is time to end the drought – and since I’m also approaching my 20th year as a home brewer (December 6th 2016 is the day), I want to make something that I can use to celebrate the vicennia of my homebrewing hobby (plus, enjoy a few bottle of between now and then). 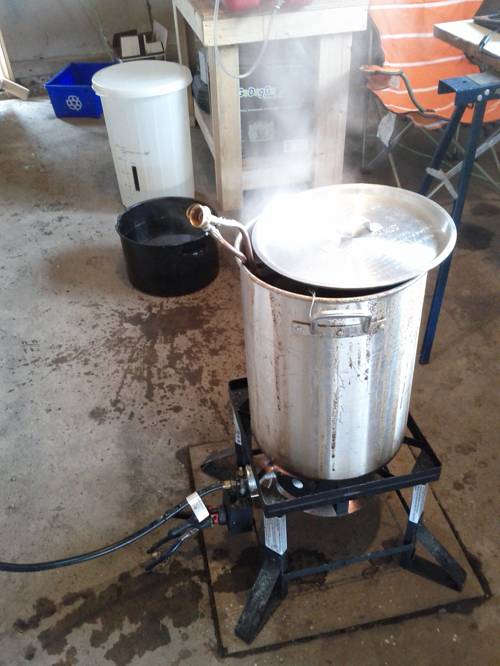 Since this is a big beer event, I need a big beer – so I’m making a sour barleywine. As in, combining my two favourite kinds of beer into one hellofa brew. This recipe is based on a recipe from Charlie Papazian’s “Homebrewers Companion”. 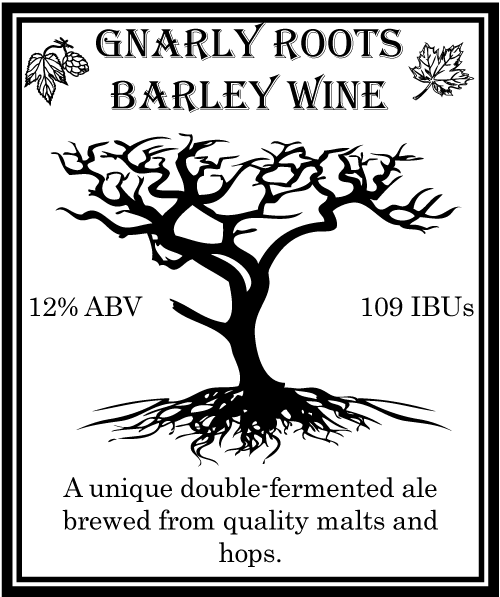 For years I’ve wanted to brew his Gnarly Roots Barley Wine; a classical American-style barleywine that is fermented with a normal ale yeast, and then soured with Brettanomyces bruxellensis & Brettanomyces lambicus. Coming in at ~12% alcohol, and requiring nearly a year to ferment, this recipe should produce a complex, wine-like beverage with the unique phenoic flavours and aromas imparted by brettanomyces yeasts. I’ve staid nearly true to Charlie P’s recipe – aside from altering the bittering hop from Erocia to Chinook, and upping the portion of the beer brewed all-grain (its too big a recipe to do a 100% all-grain brew using my setup). This beer should fulfil my cravings for both a barleywine and a sour. Recipe and brew-day noted are below the fold. It was a typical mid-march brewday; the morning started off cold & snowy, but it was warm enough for everything to start melting by noon. It was also a long brewday – the size of Gnarly Roots meant everything took longer – from heating the mash & sparge water, to brining the batch to a boil, even to measuring out ingredients. Plus, I re-sparged the leftover grain to produce Son of Gnarly; a parti gyle’d bitter-like concoction, designed to get my beer stocks up and make use of some leftover hops. There isn’t too much to report about this brew. Things went pretty much as expected, but for one problem. Big beers like this require a long boil to concentrate the wort, meaning you begin with a larger-than-normal volume of unboiled wort. This need to concentrate the wort must be balanced with not over-boiling, which can overly darken the final beer. Unfortunately, I erred on the side of underboiling, and over-shot my final volume. Instead of 20L, I ended up with 24L – and thus a S.G. of 1.100 instead of 1.109. I also over-extracted the grain, meaning Son of Gnarly will be weaker than planned. 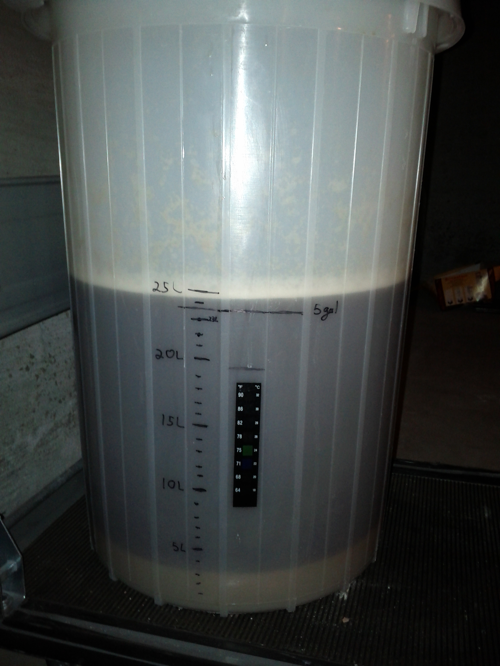 On the plus side, the cultured yeasts did very well and I have more than enough yeast to start this beast. Starting early next week I’ll have to begin getting the Brett yeast ready for their multi-month fermentation of this beer. ← Craft Brew Review – 4 great beers. I have not yet bottled this beer – Barley wines (with or without Brett) typically need 6-12 months of ageing before bottling + additional bottle ageing to reach their full potential. I'm shooting for the middle of this range, meaning I plan to bottle mid-November. I expect this beer to last many years, changing with each year. Hey Bryan, I'm wondering if you've tasted this yet? It's going to be one of my next brews. I've only brewed it – I've not tasted it yet. I have high hopes, but cannot make any guarantees. I was looking at this recipe the other day thinking I want to give this one a try. Now that I know somebody else has brewed it I'll be adding it to my "to brew" list.